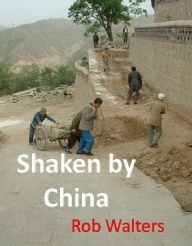 Shaken by China is a pacey novel based in modern China. It is eventful, thoughtful, and provides an intriguing insight into the modern republic. The manuscript had a remarkable effect on friends: one of them read the entire thing in one sitting. Very briefly Shaken by China is a story in which a young man escapes his overpowering problems at home by taking a teaching job in the rapidly changing world of modern China. It is targeted at readers who like a fast moving story based in exotic surroundings. The novel has a strong beginning in a Xian hospital where Keith Hackett, the main character, twice attempts suicide. The reader is rapidly hooked into the tale: why is Keith in China, what has he done that he is so ashamed of, and how was he reduced to the very depths of depression? We next launch into Keith's story: his teaching experience with Mary, his friendship with Peter, their 'minder' at the school, his observations of the joy and misery of the impoverished people who live around the school. Then suddenly, mysteriously, Mary disappears and Keith's life starts to unravel as he becomes entangled with a pretty student. Realising his own stupidity he ends the relationship and slips into less passionate friendships. However, this new found contentment is fragile and is quickly dashed when the affair with his student rebounds with chilling repercussions. The story then develops around Keith's ignominious escape from the school, his long march across the mountains of Shaanxi province, and his debilitating life as a forced labourer in an illicit brick factory.It ends in the hospital where Keith confronts his failings and reunites with the love he left in fleeing to China. The novel is based around my own experience of living and teaching in China and uses true accounts of slavery and corruption that have occurred in the republic.